Cerebral Refreshment by the Barefoot Executive: One of my favorite German phrases…! Comments Comments Off on One of my favorite German phrases…! 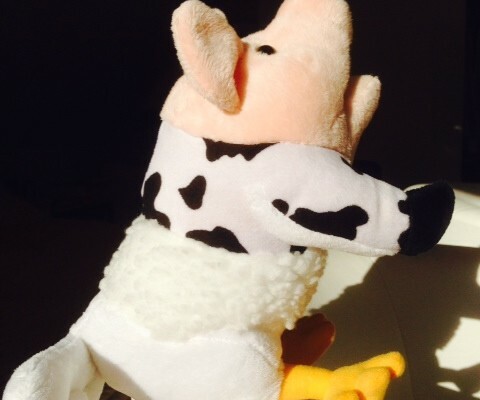 This stuffed, concocted livestock sits on my study table as a reminder of what could be an allusion to many Mothers around the world – an Eierlegende Wollmilchsau. (pronunciation guide: I-er-lay-gend-er-vol-milk-sow). It is a German Idiom that literally means an egg laying, wool and milk providing, pig. The concept of this fantastic fictitious animal is that of perfection! Something or someone who can do absolutely everything – like the animal itself in this case – a pig that lay eggs, provides milk wool and later bacon. I received this as a memento at a conference last October and I have cherished it since. Like most mothers, I am the driver, the cook, the launderer, the counselor, the nutritionist, the academic advisor, the disciplinarian, the friend in need, the fashion coordinator and the food stockist, who has, among other motherly responsibilities, the personal challenges of retaining health, sanity and my place at work, before I call it a week and put on my party clothes to look just as svelte as I did before the kids arrived. Of course my husband helps but it goes without saying that I the primary caregiver. The primary eierliegendewollmilchsau!! I absolutely love the phrase and the stuffed version of the same. Do you have any such allusions from your culture or country? I’d love to hear.